An unforgettable experience in a plush and Napoleonic décor, thanks to chef Yannick Alléno. : A stone's throw from the Champs-Élysées, this Second Empire historical pavilion enjoys a sumptuous décor on two stories with woodwork, ancient paintings and caryatids. Chef Yannick Alléno, formerly at Le Meurice is his own boss at Ledoyen. It is a big endeavor, comporting some risks, all the more he nourishes the ambition to adorn the sauces, the foundation of the classic cuisine (as a matter of fact, he wants to know everything about it in order transcend it) with a new legitimacy thanks to the modern technology developed in concert with the researcher Bruno Goussault, inventor of the vacuum cooking. In short it consists in exalting the savors when they are extracted at the right temperature of vacuum cooking concluded by a cold concentration. The result is stunning, combining virtuosity and density. Fennel, celery, Jerusalem artichokes, chicken, are metamorphosed by Alléno’s into magical philters. Enjoy the dazzling savor of a pike bread served with an extraction of mushroom and lobster, the daintiness of mussels with an extraction of cod fish, a grand thick roasted turbot with bone marrow and the superb poularde with a parsnip extract. A new ordinance also: just choose the main course (vegetables, fish or meat); the chef will compose the appetizer and the dessert. 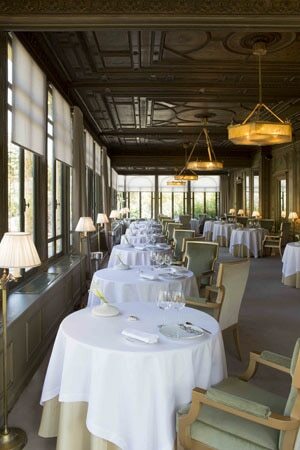 The menu at €135 for lunch features many highlights, the beef tartar wrapped in burnet leaves with cucumber and black sesame tuile and the delicious duck aiguillettes with peer stuffed with foie gras and pommes soufflées. The desserts are magnificent creations. Impeccable service; sublime wine cellar, in keeping with the standing of the place. It is only the beginning of the new life of Alléno, he is planning to surprise us with other new wonders. We are licking our lips.